Do you know, I don’t think I’ve done an entire post on a book review before… I don’t think I’ve done a proper cookbook review either [shakes head]. I was rapt to be sent a copy of Rachael Devcich’s ‘Eating Clean – Living Paleo’ to have a good squizzy at, ahead of it’s launch this week. Suffice to say I’ve been busy in the kitchen giving it a jolly good road-test before…. I GIVE IT AWAY! I know, madness, I don’t know what’s possessed me because, I’ll cut to the chase: This cookbook is a beautiful thing and one lucky person is going to be pumped to be receiving this via my Facebook giveaway (click here for my Facebook page – The Giveaway will start on 8 August 2015). I won’t beat around the bush, this is a paleo cookbook. Paleo, in case you aren’t familiar, is the trend in eating that’s been growing steadily overseas and in NZ and is ideal for people with food intolerances to gluten and/or dairy, or who want to cut refined sugar out of their diet. It’s at this point I need to mention, I am NOT a paleo convert! Don’t get me wrong, I actually love paleo food and, if you’ve been following my blog for a while you’ll know I’ve blogged a few paleo recipes. My position is that I totally get the paleo philosophy. I reckon there’s some top notch fooder from the paleo bandwagon, but I’m not a, well, paleo nut. I’m more of a “I eat everything in moderation” kind of chick. That said, I reckon sugar is fairly evil and I try to avoid refined sugar and highly processed food as much as I can (read this post) and, more recently, I’m playing around with the LCHF (low carb high fat) concept. With that spiel out of the way, I do own a few paleo and clean eating cookbooks and, currently, these are some of my more well-read and reached for cookbooks when I need a burst of inspiration. But, I am not, I repeat, a paleo cheerleader/convert. 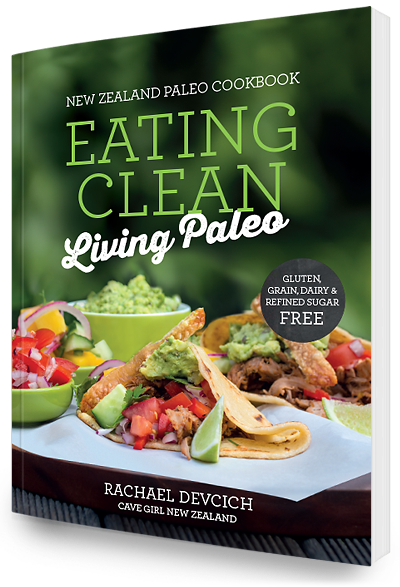 Anyway, Eating Clean – Living Paleo is NZ’s guide to paleo and is jam packed with over 100 gluten, grain, dairy and refined sugar free recipes. It’s the brainchild of Cave Girl Rachael Devcich who, after changing her diet to exclude grains, dairy and refined sugar, found that her general health and energy improved so much that she’s become a massive advocate of sharing the message. I’m slightly in awe of Rachael, not only has she pumped out a stunning cookbook with drool-worthy recipes, bugger me, she’s taken all the photos and done all her own graphic design. I thought she was superwoman (and I needed some serious up-skilling) until I discovered she was a was originally a chef turned graphic designer and photographer. Lucky her: It’s an award winning combo (I said it here first).